The blockchain technology industry has seen $10B in total all time funding. Let’s analyze the investors making bets into blockchain technology and identify the most active firms. 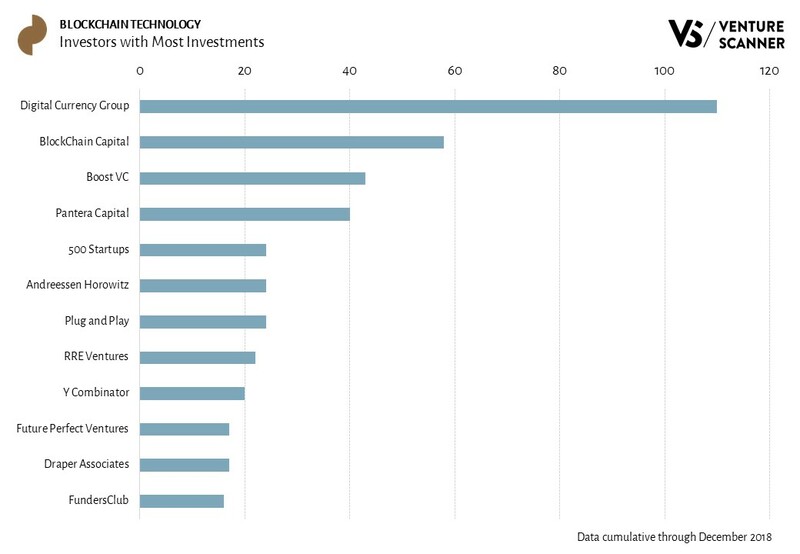 The graphic below shows blockchain technology investors based on their number of investments into the sector. If an investor participates in two investment rounds in the same company (such as a Series A and Series B), that would qualify as two investments for this graphic. As the graphic demonstrates, the Digital Currency Group has made the most bets in the blockchain technology sector with 110 investments. BlockChain Capital follows in second place with 58 investments. Examples of companies that Digital Currency Group invested in include Basis, Circle, Ledger, and BitGo. Let’s see which investors make their way onto this list in 2019!